From a single park restroom to an entire complex, Easi-Set Buildings have you covered. Easi-Set provides a vast array of modular building solutions for Parks and Recreation. These precast concrete buildings are durable, secure, and virtually maintenance-free. They are also competitively priced to keep your project costs in check. From dugouts to ADA restroom facilities, and even large field houses and visitor centers, we make it easy to get your facility done on- on-time and on-budget. We also make it our job to make your job easier - both today and in the future. That's why designed our buildings to go up fast but stand the test of time. There's no size project too large or too small for our nationwide network of licensed producers, they will cater their level involvement in the construction process to your specific needs. Precast Concrete is our material of choice for its ability to imitate virtually any existing structure. Not only will your building last for decades, but with our fully-customizable options it will match perfectly with the rest of your facility, and surroundings. Choose from a wide variety of finishes, textures, and colors. We understand that each project is different. That's why we let you decide if you want your building is delivered bare bones like an untouched palette or fully outfitted, ready to use as soon as construction is complete. Come to Easi-Set for all your facility needs, it's the easiest way to build. Go online or call for a free estimate. 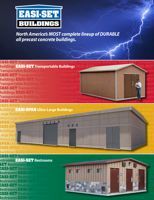 Take a look though our 20-page PDF brochure to learn more about the many solutions offered by Easi-Set Buildings. Easi-Set designs and manufactures all-precast concrete buildings that can meet all of your parks and recreation needs, from simple utility shelters and single restrooms to complete facilities. Easi-Set restrooms are a permanent and economical solution for parks & recreation facilities, schools, transportation facilities, military bases and remote installations. We produce single, double and multiple-user restroom buildings. 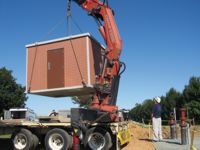 Our smaller restrooms are delivered to the site pre-assembled, pre-plumbed, and pre-wired. Our larger restrooms are pre-manufactured and then site assembled. Customize one of our options to meet your exact needs, saving significantly over traditional stick built construction and proving an incomparable upgrade to porta johns. Visitors are looking for refreshments and your organization is looking for revenue. The ultimate solution is a safe, secure, beautiful concession stand that requires almost no maintenance. Precast concrete concession stands are the answer. But more than that, they can be customized to your existing surroundings, and can easily be combined with restrooms and press boxes for a complete solution for your needs, transforming your facility overnight and becoming a welcomed addition to the community. Press Boxes designed to fit your specific needs, colors and budget. Our most compact two-story press box sits on a footprint of just 6'x10'. Looking for a comprehensive solution? We produce custom solutions including the press box, multi-user restrooms, and a concession stand consolidated under one roof. Most of our precast concrete press boxes are set-up and ready to use in just one day. Resistant to disaster and vandalism, built for decades of hard play. 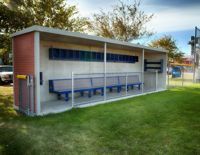 Precast concrete dugouts by Easi-Set are an economical way to improve the look of your ballfield. Our dugouts are delivered fully assembled and are ready to use the same day. Show the players in your league how important they are by giving them a "home field" advantage with their own dugout. Easi-Set dugouts are cost-effective alternatives to built-in-place construction, and require less lifetime maintenance. Dugouts are available in standard and custom sizes, colors, and finishes. 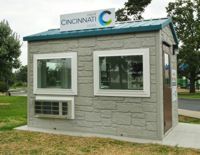 Keep your facility and staff safe & secure with precast Guardhouses and Ticket Booths. While these buildings are functional in nature, they don't have to be an eyesore. You can customize them with a variety of textures, colors, and finishes. Your guests will feel secure entering your facility and have their first interaction be a positive one. Precast guardhouses are pre-assembled, and pre-outfitted to your specifications. Ballistics resistant and rated for 165 mph wind loads. For decades, Easi-Set precast buildings have been proven for utilitarian uses. Whether it is a pump house for a pool, chemical storage, a generator building, or simply a place to store your sports equipment safely, precast concrete provides a very safe and durable solution for all these needs. If you go to our website look at the different options under the applications and product tabs. We can also customize a solution of your specific needs. Bring everything under one large Easi-Span roof. A combination Easi-Span field house is the perfect solution for schools and community sports parks. Keep all of your locker rooms, training facilities, offices, equipment storage and utility needs in one cost-effective, consolidated space. We customize your field house to your exact needs. With widths up to 50 feet, unlimited lengths, and ceilings as high as 35 feet you have unrivaled flexibility in designing your space. 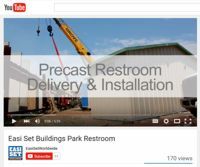 A video showing an Easi-Set all-precast concrete modular restroom being delivered and installed in Lee Park, Petersburg, Virginia. Our nationwide network of licensed precast produces can arrange the entire construction process for you if needed, from handling permitting and site preparation to fully outfitting your building and installation. Easi-Set restrooms are the easy solution for your park, school, or recreational facility, from single waterless remote units, to large multi-user facilities containing locker rooms and showers.